The most important ad for a company or brand is its Website. So why not use that Website to generate ads? Dapper, a startup that can create a feed from any Website, is applying its technology to generate contextual, display ads from the constantly changing content on an advertiser’s own site. Everyone from Google to Yahoo is working on contextual display ads in an attempt to make display ads as relevant as contextual text ads. Like those efforts, MashupAds takes its cues from the content on the page where the ad is being served. 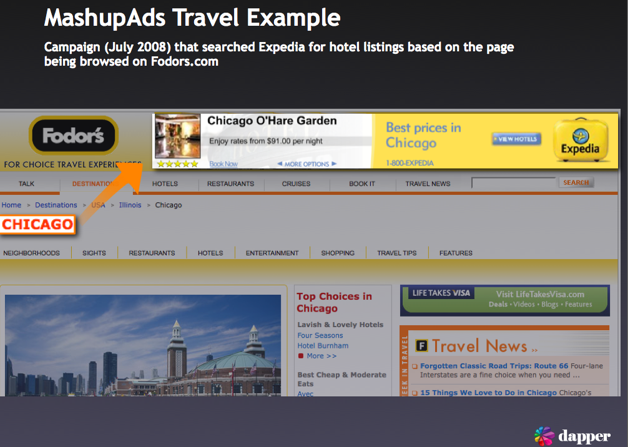 So if you are researching what to do in Chicago on Fodor’s, you will get display ads for hotel rooms in Chicago. Where Dapper takes a step further is that the creative content in those ads are pulled directly from the relevant portion of the advertiser’s Website. For instance, for a Marriott ad, you might see the Marriott hotels in Chicago along with room availability and prices. Click on Berlin, and you see the ads for hotel rooms in Berlin. When Marriott changes something on its Website, the changes are reflected in the ads. The Website is the ad (even on other sites). MashupAds: A contextual, interactive display ad ready to traffic in < 10 min from Paul Knegten on Vimeo.